Once upon a time, I was a college student, living for the most part in the insular world of design school, force-fed (not really) with ideas that were not my own. In many ways, I was trying to find myself, to define the architectural niche into which I felt I fit best. I was at once sure and unsure of myself, confident yet questioning. And sleep deprivation and high caffeine intake did not help my situation at all. The college I attended had a periodical magazine that was student-run, so one semester I leapt at the opportunity to express myself, to define on paper why it is I love architecture. To find, through writing, my niche. I submitted the article (which, like all other submissions, did not get published because the magazine had funding issues; that’s another story), then had second thoughts. I was afraid of putting myself out there, of making the reason for my passion known to all. That was in 3rd year. 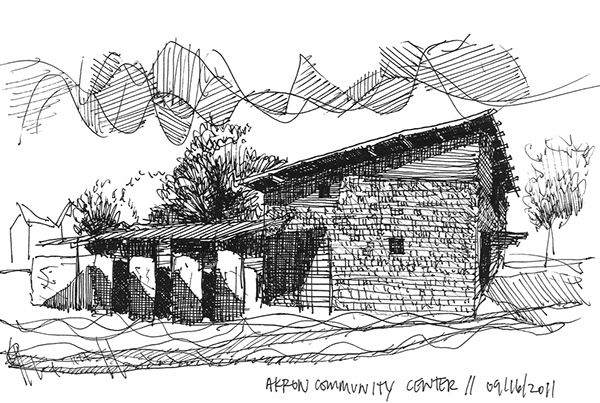 Justin Park’s sketch of the Akron, Alabama Community Center. Click on image for source. Today, after being reminded of the importance of a socially conscious architecture, I yanked my essay from the recesses of my 2011 emails to see what I had written, to catch a glimpse of my 3rd year self. This is what I had to say back then. Do I still believe it today? Mostly, yes. Welcome to Throwback Monday. No alliteration. On purpose. I used to think it was a sham, a rigorous exercise in futility. I would silently observe people engaged in what I believed were pseudo-philosophical conversations about the “epistemological essentials of edifice assembly” and I would become inwardly indignant. I deliberately shunned books by great thinkers who had the ability to deliver a convoluted sermon on the profundity of a box, and steered clear of those who would bestow complexity on a circle or a square. I naively believed that such had no knowledge of the gritty, hands-on nature of the architectural profession, and were merely theorists, at best. Well, I was wrong. I have since learned that not only were some of these thinkers pragmatists as well, but I also realized that the theory they spoke of does have an occasional part to play in informing practice. Now, at times, I am just as much a theorist as those I sought to avoid in the past. I have found conversations about the depth of architecture to be refreshing. I sometimes find myself contemplating the impact a classmate’s work has had on me, and am occasionally forced to admit to myself that a box can indeed be profound, especially when placed adjacent to another box that is itself placed on yet another box that happens to be surrounded by several boxes…but moments like these are few and far between, and are usually preceded by sleepless nights and copious amounts of tea. However, at yet other times, I am indifferent to the intellectual and philosophical aspect of architecture, and I am content to simply draw a line or two that will ensure that the occupants of the building I conceive of will be protected from the wind and the rain. It is during moments like these that I remind myself of the reward of making my own desires secondary to those of the people I will serve, and tell myself that I am satisfied to work in obscurity provided I do my best to ensure that my clients’ needs are met. These moments, often quiet lapses of time spent at my table with a pencil and sketch paper in hand, supersede the rest. It is because of them that I can relate to works by people like Samuel Mockbee and Diebedo Francis Kere, architects who go unheralded in a sphere that is increasingly becoming, in the words of [a former classmate], one big “gimmick.” I will admit, though, that there was a time when this profession I speak of was nothing more to me than a means to a selfish end. Time has changed that. It is still a means to an end now, but a selfless one, I believe. This is why I love architecture – because I believe it to be an altruistic profession, one aimed at bettering the lives of others. 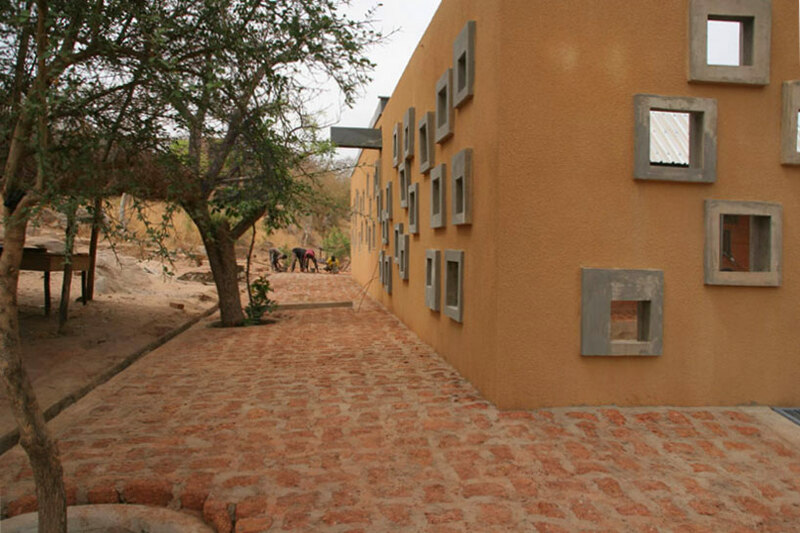 The Francis Kere-designed Centre for Health and Social Advancement. Click on image for source. But perhaps another reason I am passionate about architecture is because I find it to be continually engaging, always multifaceted, and seemingly paradoxical. I sometimes speak strongly against people whose work ends up informing some of the moves I make with my pencil (or my mouse). I criticize Aalto’s work in one instant and then pore over his drawings in the next, searching for tectonic clues. I roll my eyes at Wright’s utopist ideals, and then turn around and marvel at Fallingwater. I agree with Mies. Less is so much more. But sometimes Robert is right, and less is a bore. There is truly a complexity and contradiction present in architecture that makes it stimulating. As I write this, I am still a student. I have dabbled, but am as yet inexperienced in the art of nine-to-five office work that can make the pursuit of skillful building design seem mundane. But I hold to my ideals. Complexity. Contradiction. Above all, altruism. I remember the original first paragraph of this article. :’D. How far you’ve come!!! How faithful He is. “I… am occasionally forced to admit to myself that a box can indeed be profound, especially when placed adjacent to another box that is itself placed on yet another box that happens to be surrounded by several boxes.” <- hilarious. The beauty of architecture, I suppose. Good read. Thanks for sharing. Just touring your site for the first time. Most people do not have true passions to talk about so it’s great that you have one and you are great it. Am yearning to see African architecture that is not inspired by architecture from any other region, yet embracing modernity. Anyway, great article. I’ll be checking for more. Thanks for stopping by! Yes, keep coming back! Haha! Share away! Have yet to meet him, BTW! Sometimes I get caught up thinking and debating by myself whether to do design as per the design brief or as per my assumption of what the client needs… I tend to think after all I am a professional I should dictate solutions to their needs,isn’t it the reason I am spending sleepless studio nights, but how selfish is that, at the end of it all the end user will have to live with my selfish decisions whilst I go and impose my ideas on others…which brings me to altruism, something new to think of, it will go a long way into helping me with my dilemma. Reading this post has led to the realization that I have to adjust my attitude as to how I approach design. Copyright © 2019 THE AFRICAN AGORA – Designed & Developed by ZThemes.